I kept seeing this brand pop up on my Instagram feed with girls raving about it. So, I was interested to find out for myself if it really worked. It states it will promote hair growth (and make it thicker), improve my nails and make my skin look more smooth and plump- umm yes, please?! As you know, I only share products with you all that I have tested myself, and actually, believe in. After I shared with you (via my Instagram story) that I was trailing it, I was flooded with Instagram messages and emails from you all wanting to know what I thought of this product. I was then contacted by ProPlenish to share my thoughts, and I only agreed to write this post after I used the product for quite some time so I could make sure I loved the results. I am so excited to share that I have seen such an incredible result. My skin and lips look and feel much more plump and smooth, and my hair and nails are definitely stronger. I have always had thick hair, but after having Aston (and breastfeeding), my hair was so much thinner around my hairline. It has been growing back (very slowly I might add) but taking ProPlenish has definitely helped the cause. You are probably wondering (like I was before I started using it) how does it actually work?! and is it healthy for you to take? As we age our natural collagen production slows down, so including ProPlenish Marine Collagen into your favourite drink or smoothie increases the body’s natural collagen production from the inside out. ProPlenish is the purest and highest grade marine collagen in the world as it’s sourced from deep sea fish. It is 100% natural protein. It contains no artificial, colours, flavours, additives or preservatives which is a big tick in my book (and it’s safe to take while breastfeeding). 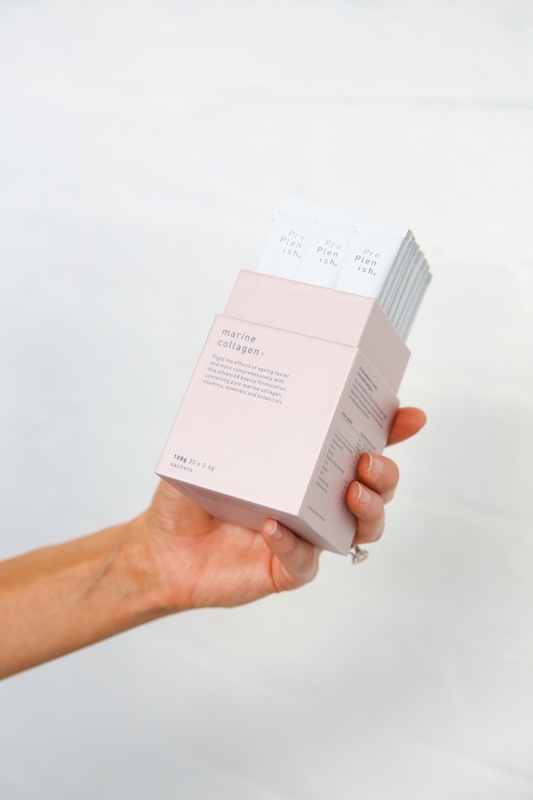 ProPlenish have recently introduced Marine Collagen + which is a new advanced formula (a super charged version of their original) which contains pure marine collagen along with 9 other vitamins and minerals for complete health and beauty in one sachet. I can be so lazy at remembering to take my vitamins, but I have found this so easy, as I just pop it in my smoothie or my first-morning coffee. I also then put a few original sachets in my bag and pop it in water during the day, it dissolves quickly and is easy to drink with barely any taste. I started off taking three sachets a day, but now, I only take one a day as I have been using it for three months. 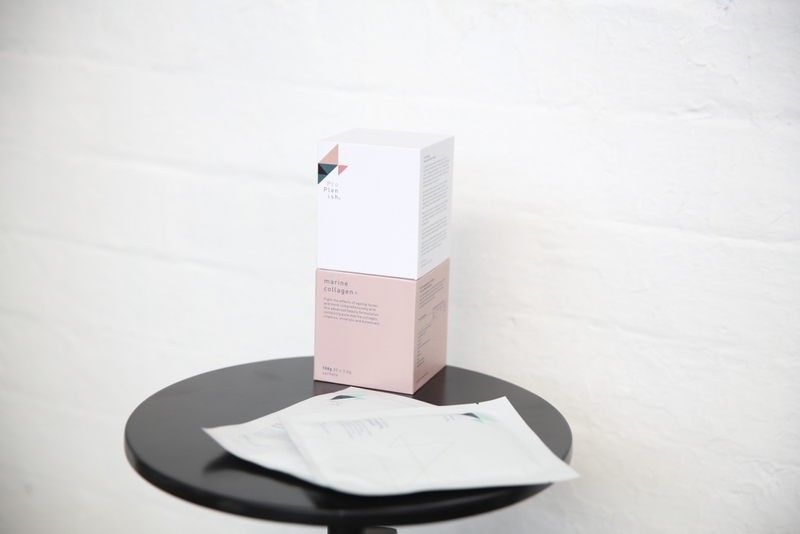 I have also been trialing the new Anti-Ageing face mask, and it is incredible! I think it is the perfect addition to the drinkable collagen as it contains Swiss Snow Algae (which I hadn’t heard of before, but boy does it work) alongside one of my favourite anti-ageing ingredients, hyaluronic acid to boost collagen and reduce wrinkles and fine lines. It’s the perfect mask to use when you have a big event coming up or if you are getting ready for the races like I am. I am so excited to offer you the chance to try my new favourite beauty supplement and receive 15% OFF when you use the code NadiaLoves at checkout. This is only valid until Sunday 1st October so be quick! Enjoy ladies!